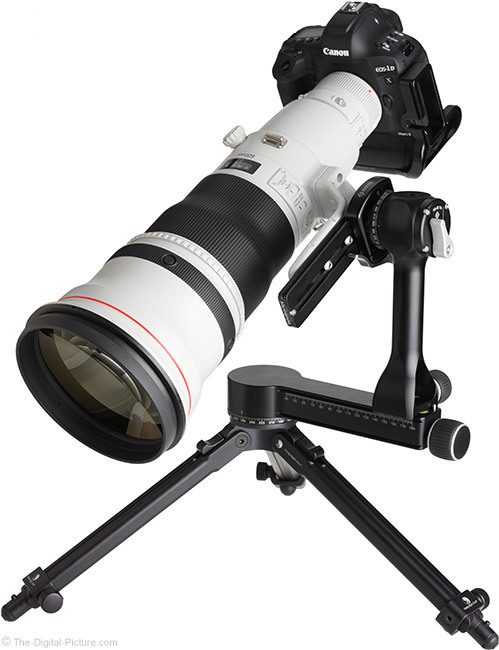 Just posted: Really Right Stuff PG-02 Pano-Gimbal Head Review. 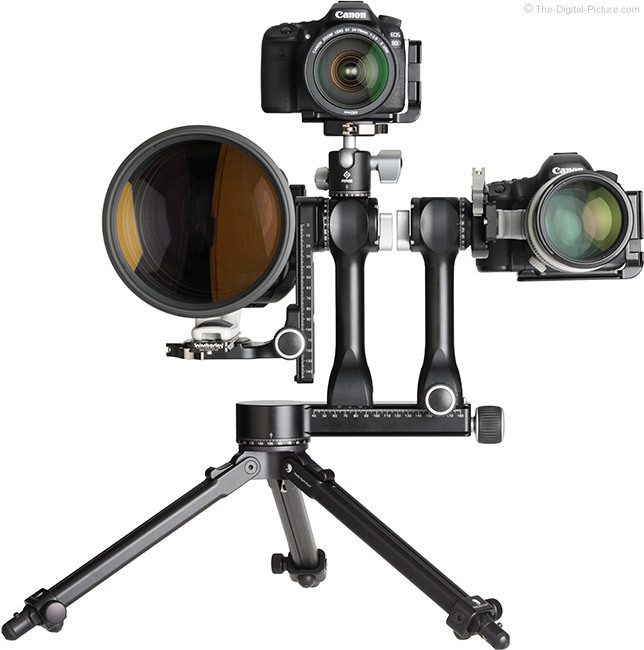 The Really Right Stuff PG-02 Pano-Gimbal Head is in stock at B&H. Having a selection of RRS parts is a bit like having a pile of Legos. Once you get started, you just want to keep building (and you find yourself "needing" more parts). While the rig looks cool, it is surprisingly usable. And, the gear is truly impressive. Based on what you see here and knowing what I've already reviewed, you can likely figure out what the next review subject is. Crazy rigs of course need a name. I decided to call this one the RRS Radical Rig with "Extravahead" in the running. Sean had some other good ideas – please share your own alternative name suggestions with us. 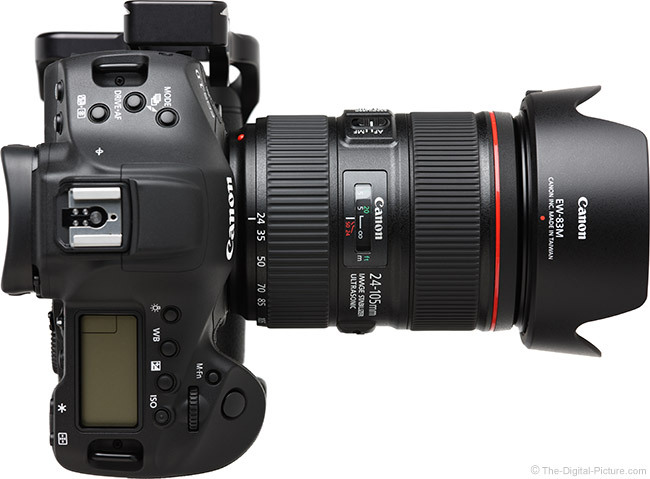 Image quality test results from a third lens have been added to the Canon EF 24-105mm f/4L IS II USM Lens Review. I finally made this lens part of my kit. Great deal: the Canon USA Store has the Refurbished Canon EF 24-105mm f/4L IS II USM Lens available for only $779.20 with free shipping. Compare at $1,099.00 new. Refurbished items from the Canon USA Store are like new and come with a retail-matching 1-year warranty. The Canon EF 24-105mm f/4L IS II USM Lens is in stock at B&H | Amazon | Adorama | WEX. April 27, 2018, Commack, New York - Tamron announces the launch of the 28-75mm F/2.8 Di III RXD (Model A036)- a high-speed standard zoom lens for Sony E-mount full-frame mirrorless cameras. This new zoom lens delivers superb optical performance, including both outstanding image quality and beautiful background blur effects (bokeh) only possible with a fast aperture, thanks to a new optical system designed specifically for mirrorless cameras. The lens will be available at Tamron's authorized USA retailers on May 24th at $799. The usefulness and versatility inherent in compact full-frame mirrorless cameras are enhanced by this new Tamron lens' compact size and lightweight-it measures only 4.6 in. and weighs just 19.4 oz. The Model A036 incorporates an all-new high-speed and precise AF driving system. The RXD (Rapid eXtra-silent stepping Drive) strikes a balance between speed and silent operation, making it perfect for both video and still image capture. In addition to shooting portraits with creative, defocused backgrounds, photographers can enjoy dynamic wide-angle expressions like never before thanks to a Minimum Object Distance (MOD) of 7.5 in. at the wide-angle zoom setting. The lens also features Moisture-Resistant Construction that is useful in outdoor photography, plus hydrophobic Fluorine Coating that is highly resistant to fingerprints and dirt. In addition, the Model A036 will fully match with various camera-specific features including the in-camera lens correction and Direct Manual Focus (DMF) system features of Sony cameras, enabling this new zoom to take full advantage of the advanced functions that ensure comfortable user experiences. Comfortably lightweight (19.4 oz.) and compact (4.6 in). 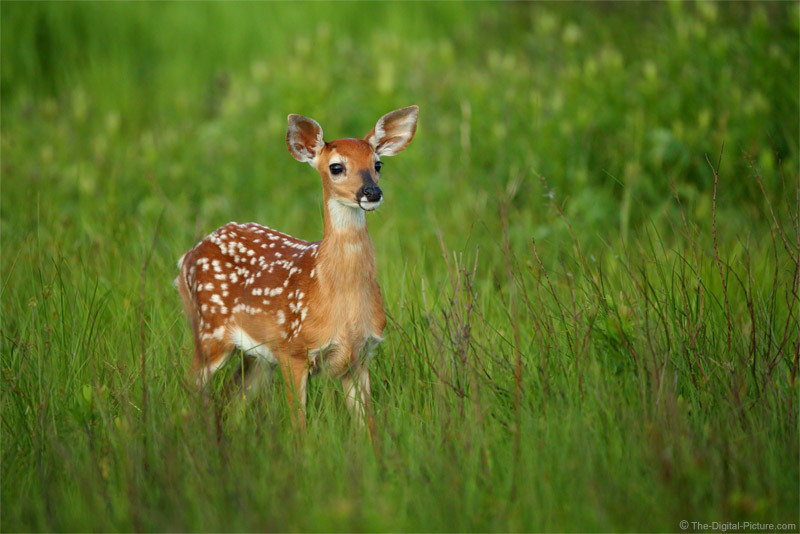 Minimum Object Distance of 7.5 in. ; Working Distance 2.24 in. All-new “RXD” stepping motor AF unit is excellently quiet and therefore perfect for video capture. Consistent with Tamron’s exciting, ergonomically superb next-generation design. 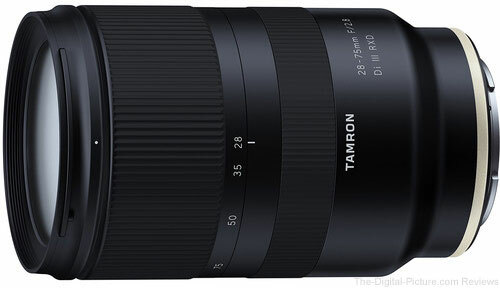 B&H has the Tamron 28-75mm f/2.8 Di III RXD Lens available for preorder. B&H has posted several presentations from its Depth of Field 2018 Event on its YouTube channel. For years, I’ve been searching for the perfect camera. Now, as a disclaimer, I don’t actually believe such a thing exists. Rather, there is a perfect balance of technology and physical size for my own intended purpose of everyday carry. I categorize myself more as a cinematographer than a photographer, but I’ve always wanted a camera I could utilize as a director’s viewfinder for location scouting, as well as something that had the capability of capturing stunning candid photos for use in a look book or simply to share on social media. At the end of the day, I firmly believe that the best camera is the camera you have with you. Some may say, just use my trusty smartphone. However, I’ve rarely connected emotionally with an image produced by a small sensor the same way I do with images captured by more traditional cinema or larger format photography sensors. Aesthetically, achieving the shallow depth of field on a small sensor camera is much more difficult with current technology. I’ve used all of the fancy depth mapping and dual lens tricks that very smart people have built to try to simulate the depth of field achieved by a proper camera. However, whether it’s strange edge artifacts or just a much less pleasing focus roll off, those images just never felt right to me. This same small-sensor aversion is also what kept me away from Canon’s original G Series and other PowerShots. However, with the introduction of the larger 1” sensors in cameras like the G Series, XC10, and XF400 I saw the beginning of a move in the direction I had always been hoping for. 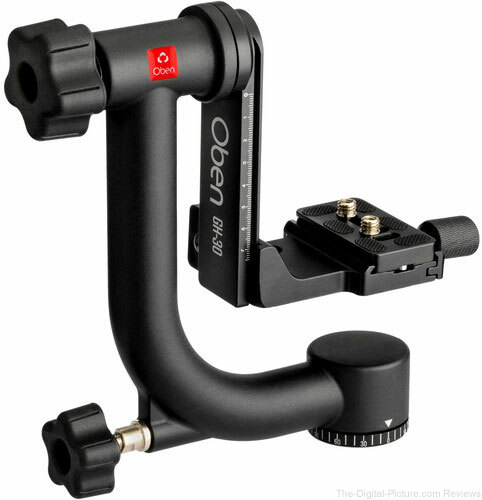 B&H has the Oben GH-30 Gimbal Head in stock with free expedited shipping. The Tamron 70-210mm f/4 Di VC USD Lens is in stock at B&H with free expedited shipping. About 8 years ago, I purchased a 4' x 6' (1.2 x 1.8m) softbox from eBay (they aren't even available anymore) and really liked the soft light it projected onto my subjects. However, the more I used it, the more I realized how impractical it was. 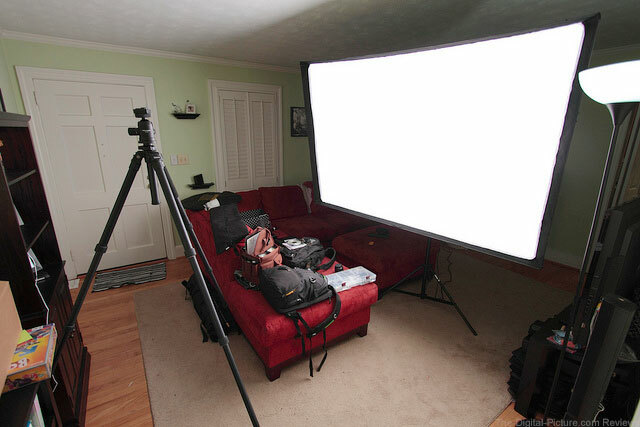 The biggest problem was that the softbox's weight was too heavy for my studio strobes' spring loaded mounting fingers. The softbox would mount to a studio strobe under ideal conditions, but any movement of the softbox (repositioning, small gust of wind, etc.) would cause the it to dismount from the strobe and [usually] break the modeling light and/or flash tube in the process. And even if the softbox stayed connected to the studio strobe, the studio strobes positioning handle couldn't be tightened tight enough to prohibit the softbox from slowly inching its way downward at the pivot point. The problems inherent to the weighty modifier meant that it was rarely ever used. That is, until I recently came across a solution to the problem. Shown above is a Mountable Speed Ring, and it works with any soft box that features a traditional speed ring and spoke design (it won't work with collapsible/umbrella-like folding ones). The mountable speed ring features a threaded insert that can attach to a 3/8" stud which is mounted in a traditional umbrella swivel. 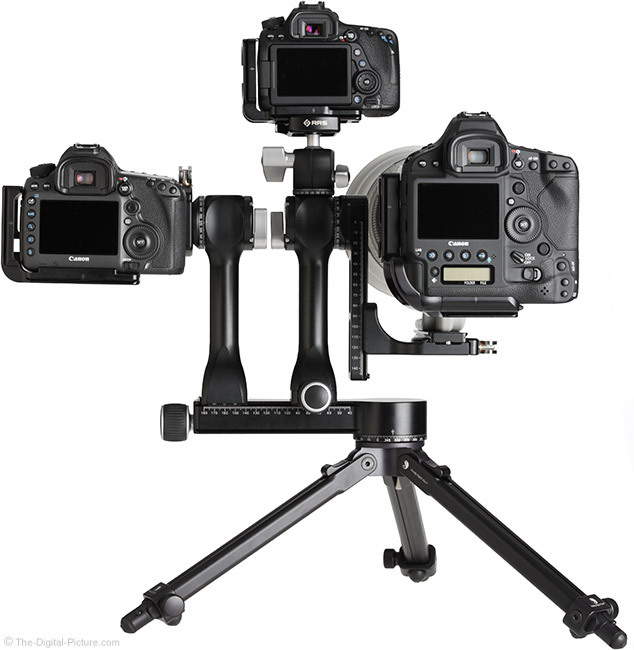 This setup relieves the strobe's mounting fingers from supporting the weight of the modifier; instead, the fingers only have to support the weight of itself. The mountable speed ring will be especially helpful for anyone suspending a large softbox above a subject or with the modifier pointed downward at a significant angle as gravity will be pusing the strobe into the mounted speed ring instead of pulling the speed ring away from a traditionally mounted strobe. However, if planning to do this, it would likely be best to permanently affix the 3/8" stud to the mountable softbox with epoxy/glue. The mountable speed ring's risk-reducing design may be the most economical insurance you ever buy. There are three versions of the mountable softbox currently available for compatibility with Paul C. Buff/Alien Bees/White Lightning, Bowens and Profoto. 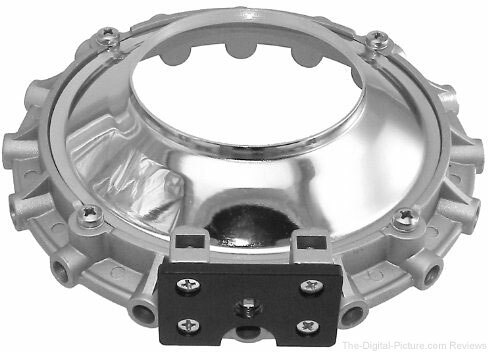 However, while I cannot confirm that this is the case, if you have a similar non-mountable speed ring with interchangeable mounts (most third-party speed rings are designed this way), then you may be able to swap out any of the mounts available to make it compatible with your own strobes. Now live: Canon EF-M 18-150mm f/3.5-6.3 IS STM Lens Review. A big thanks to John Reilly for his continued efforts in reviewing the EF-M series lenses! 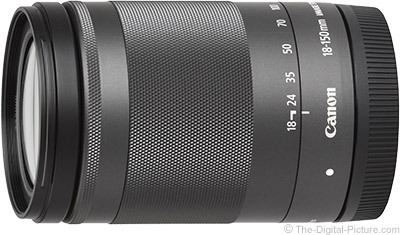 The Canon EF-M 18-150mm f/3.5-6.3 IS STM Lens is in stock at B&H | Amazon | Adorama | WEX. Canon has released its financial results for Q1 of 2018. On the same page Canon displays a picture of the EOS M50 with the label "New Mirrorless Model - M50." It will be interesting to see what Canon has up its sleeve in regards to mirrorless cameras which may further impact its market share in 2018. An advanced, step-by-step guide to creating Creative Profiles in Adobe Camera Raw for use in Adobe Camera Raw (ACR) 10.3 and later, Lightroom Classic 7.3 and later, and Lightroom CC 1.3 and later. Please keep in mind that profiles are very different from presets, and as such, there's lots of stuff that can go wrong while making them. Experiment, have fun, and go slowly. For more details and specifics, download the SDK with sample files from this link.